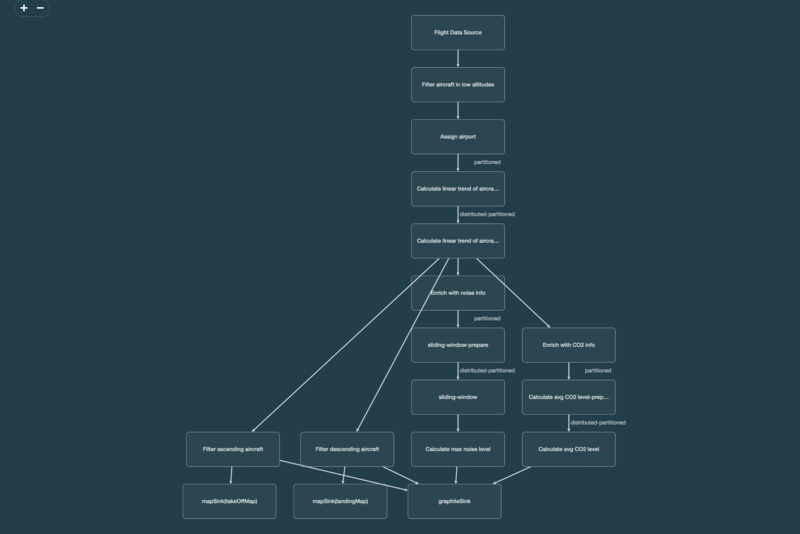 Welcome to the Hazelcast Jet Management Center Manual. This manual includes information on how to use Hazelcast Jet Management Center. 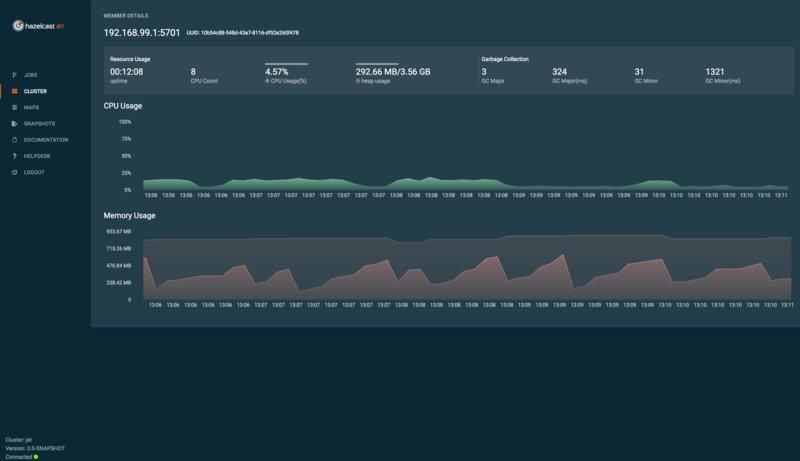 Hazelcast Jet Management Center enables you to monitor and manage your cluster members running Hazelcast Jet. In addition to monitoring the overall state of your clusters, you can also analyze and troubleshoot your pipelines in detail and manage their lifecycle. Get Started leads you through the steps to get Hazelcast Jet Management Center up and running on your machine. Configuration explains how to configure Hazelcast Jet Management Center. You can configure licensing, the underlying Hazelcast Jet Client, security, etc. User Interface Overview explains the user interface of the Hazelcast Jet Management Center. In this section we’ll get you started using Hazelcast Jet Management Center. 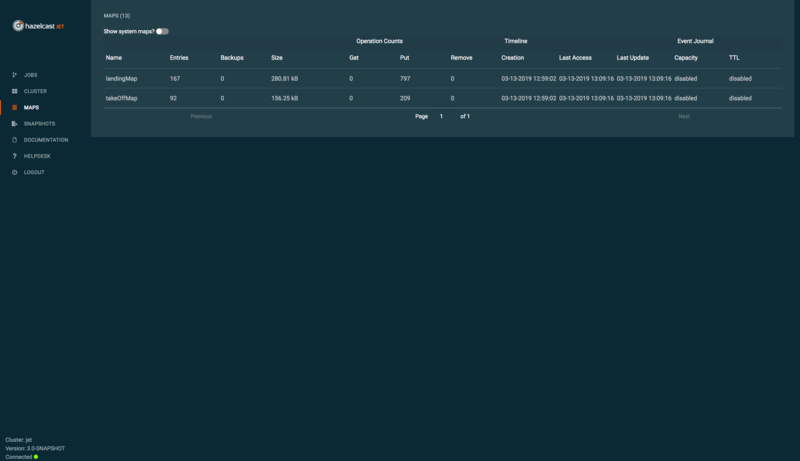 We’ll show you how to set up a running instance of Hazelcast Jet Management Center. You need Java Runtime Environment 1.8 or later for running Hazelcast Jet Management Center. You can start the Hazelcast Jet Management Center from the command line using the bundled starter scripts. Unpack the received Hazelcast Jet Management Center ZIP distribution. The ZIP archive contains the jet-management-center.sh and jet-management-center.bat files under the directory hazelcast-jet-management-center-3.0. Those scripts can be used to start Hazelcast Jet Management Center file from the command line. Run the appropriate script for your operating system without any arguments to start Hazelcast Jet Management Center with default configuration like the following. It will start the application on port 8081(http://localhost:8081/). Refer to the configuration section to provide more options when starting the application. Hazelcast Jet Management Center can be used without a license if the cluster that you want to monitor has at most 1 members. When you try to connect to a cluster that has more than 2 members without entering a license key or if your license key is expired, the following warning message is shown at the top. Hazelcast Jet Management Center can be configured via command line parameters or configuration files. 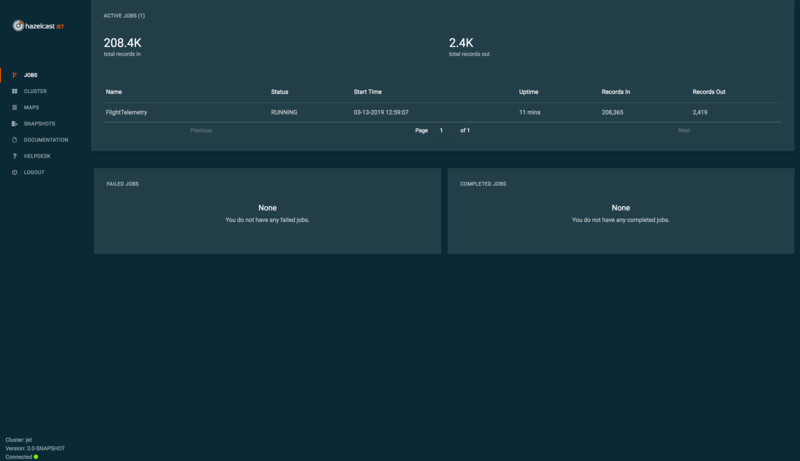 Then Hazelcast Jet Management Center will connect to your cluster to start monitoring. 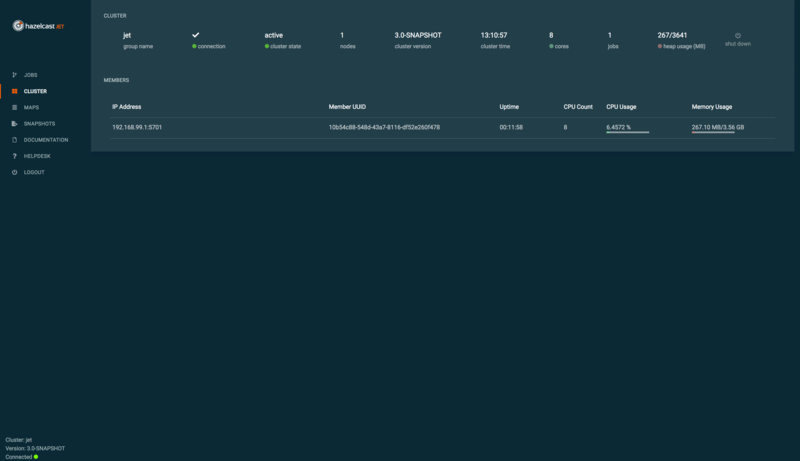 If you’d like more control over how Hazelcast Jet Management Center should interact with your cluster, then you can provide a fully-featured Hazelcast Jet Client configuration file to Hazelcast Jet Management Center. The list of parameters supported by the command-line interface can be seen below. -h, --help              Show this help message and exit. -V, --version           Print version information and exit. Hazelcast Jet Management Center can be configured via a properties file called application.properties. The ZIP packaging includes an application.properties file that you can override the configuration properties. 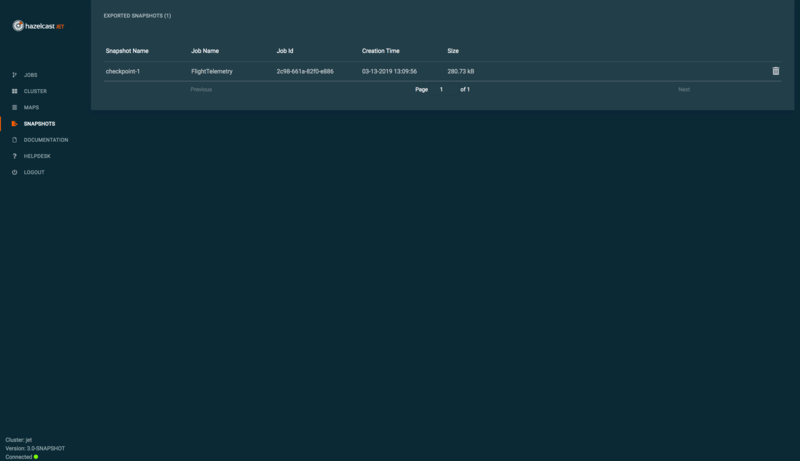 You can pass a hazelcast-client.xml or hazelcast-client.yaml configuration file, which should contain group and network details, to Hazelcast Jet Management Center to able to connect to the Hazelcast Jet cluster. Please refer to the Hazelcast IMDG reference manual for how to configure Hazelcast Jet Client inside the Hazelcast Jet Management Center to use TLS/SSL while communicating with the Hazelcast Jet cluster. Basic username and password authentication with a single user can be configured on Hazelcast Jet Management Center to prevent unauthorized parties to achieve unexpected actions on the Hazelcast Jet Cluster. When the application initially loaded login page appears as shown below. Upon successful login, user redirected to the Dashboard page which provides the fundamental information about the cluster and the jobs which are explained in detail in the Dashboard section. Below is the list of menu items with links to their explanations. Helpdesk - Link to the Hazelcast Jet Support Site. Logout - Link to end current session and log the user out. The Application includes a connectivity indicator on the bottom left, which shows connectivity status between Hazelcat Jet Management Center and Hazelcast Jet Cluster. status indicator: indicates whether connected to a Hazelcast Jet cluster or not. 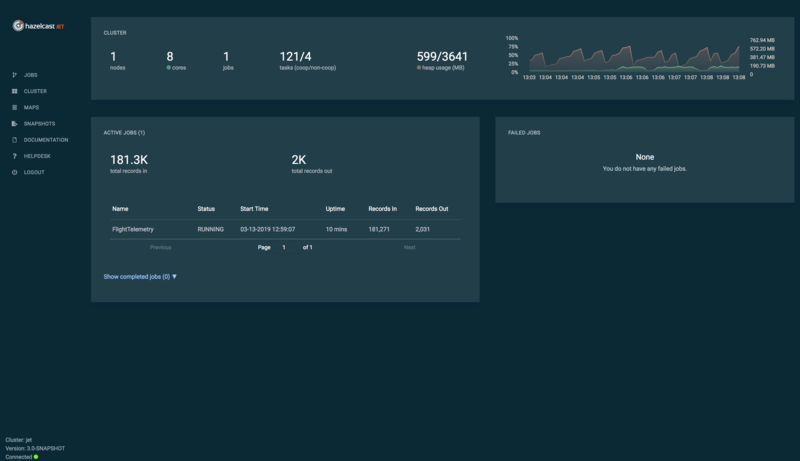 Main dashboard provides general overview of the state of the Hazelcast Jet cluster and jobs. 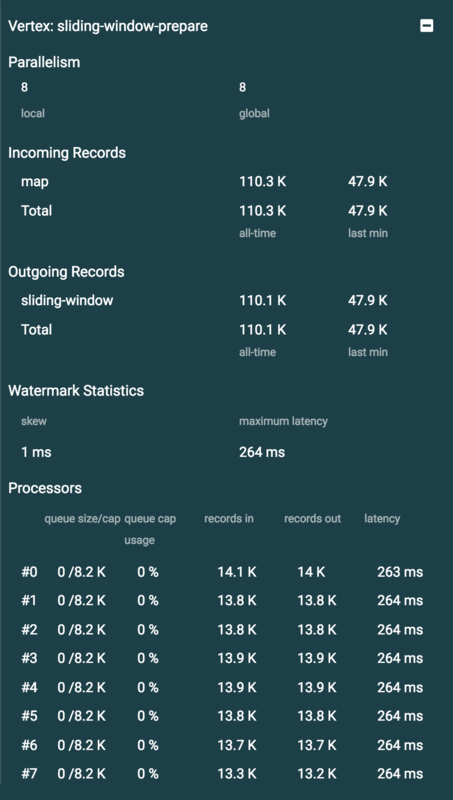 cpu&memory chart: cluster wide cpu load average and total heap memory usage. Shows the list of actively running jobs in the cluster. start time: start time of the job. up time: how long the job is running. duration: how long the job is run. description: reason of the failure or the exception. Cluster Overview screen provides an overview state of the Hazelcast Jet cluster and its members with the ability to shut down the cluster. shut down: the button allows you to shut down the cluster. You can click on any of the cluster members and see a detailed view of them. Snapshots screen provides an overview of the exported snapshots of the Hazelcast Jet jobs. To create a new export, please refer to the Job Management section. creation time: creation time of the export. size: size of the exported snapshot. You can click on the trash icon to delete any exported snapshots. Maps screen provides an overview of the maps in the Hazelcast Jet cluster. size: size of the map. get: number of get operations on the map. put: number of put operations on the map. remove: number of remove operations on the map. creation: creation time of the map. last access: last access time of the map. last update: last update time of the map. capacity: capacity of the event journal. ttl: time to live period configured for the event journal. Member Detailed screen provides detailed and historical information about resource usages and garbage collections about the cluster members. Shows the cpu load for the last 5 minutes. Shows the used memory (the amount of memory used by the member) and total memory(the amount of memory currently available to the JVM) usage for the last 5 minutes. Jobs screen provides general overview of the jobs in the Hazelcast Jet cluster. description: failure message or exception type. Job detail screen is a tool for diagnosing data flow within the job. 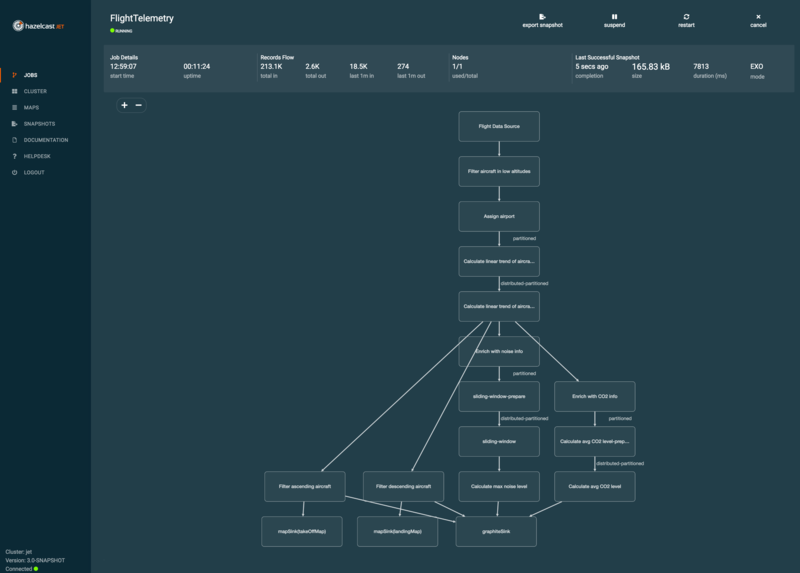 It provides graphical visualization of the stages, ability to manage lifecycle of the job and allows you to peek into dataflow stats across the DAG. One can diagnose bottlenecks this way. export snapshot: initiates a named snapshot export, exported snapshots can be managed via snapshots view. Graphical representation of the job topology. Shows information about the selected vertex on the Job Visualization section. global: total number of processors running for that vertex on cluster. Lists all of the incoming edges by their source vertices and shows the following metrics and totals for each of them. Lists all of the outgoing edges by their target vertices and shows the following metrics and totals for each of them. skew: skew is the difference between latencies of the processor with the highest and lowest latency. Most common cause is a long event-to-event interval in some source partition or an idle partition (until the idle timeout elapses). Overload of events in one partition can also cause it. latency: latency is the time difference between wall-clock time and the last forwarded watermark (“event time, time of the stream”). Multiple factors contribute to the total latency, such as the latency in the external system, allowed lag (which is always included), clock drift and, and also long event-to-event intervals in any partition (this one is the trickiest). See latency section for more information. Lists all of the processors this vertex has in the cluster and shows the following metrics for each of them. allowed lag: if you allow for some time to wait for delayed events, watermarks will always be delayed by this lag. Note that the actual output might not be delayed. event-to-event interval: if there is a time period between two events, the event time “stops” for that time. In other words, until a new event comes, Jet thinks the current time is the time of the last event. As “current event time” is tracked independently for each partition, this can be the major source of skew. If your events are irregular, you might consider adding heartbeat events. This factor also applies if you use withIngestionTimestamps since a new wall-clock time is assigned only if new event arrives. time to execute map/filter stages: they contribute with the latency of the async call or with the time to execute cpu-heavy sync call. 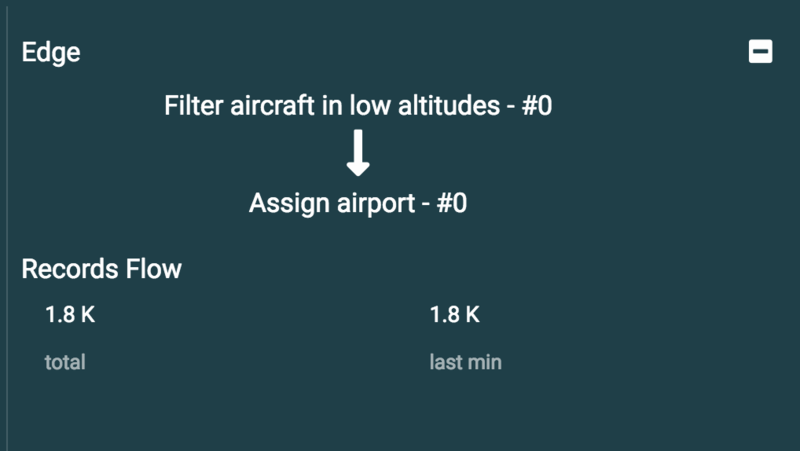 internal processing latency of Jet: this is typically very low, 1-2ms. Can be higher if the network is slow, system is overloaded, if there are many vertices in the job or many jobs, which causes lot of switching etc. clock drift: since we’re comparing to the real time, latency can be caused by a clock drift between the machine where event time is assigned (which can be also be an end user’s device). It can even be negative. Always use NTP to keep wall clock precise and avoid using timestamps from devices out of your control as event time. Shows information about the selected edge on the Job Visualization section.